There is a full moon tonight - at 9.54pm London time to be precise. The Celtic name for February's full moon is Moon of Ice, while some modern-day pagans call it Snow Moon. Both of those names seem rather apt considering that London had its first snow of this winter just a couple of days ago. The medieval name given to this full moon is Storm Moon - maybe there will be storms on the way. 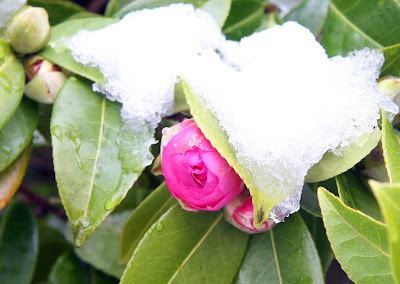 I took the photo of a spring camellia blooming as the snow started to melt yesterday.